The in-store advertising leader in France, Mediaperformances SA, has chosen BroadSign International, LLC’s digital out-of-home software to power its ShopperCast retail network. Founded back in 1985, Médiaperformances is France’s market leader for shopper media – as a subsidiary of Shopper Marketing & Cies, Médiaperformances targets brands and media agencies, with a range of solutions designed to influence the consumer’s shopping behaviour. Partner of retailers such as Carrefour, Auchan, Leclerc, Intermarché, Monoprix, Cora and U, Médiaperfomances’ customers are major FMCG companies such as Danone, Nestlé, Unilever, Mondelez and Coca-Cola. 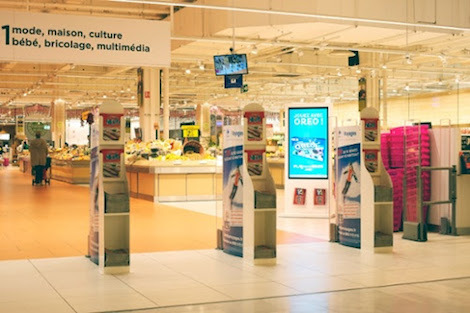 Initial deployment of 200 x 55” LED totems in 150 Carrefour hypermarkets across France has been completed. Everything is situated in store entranceways meaning that displays are visible to consumers as soon as they enter. One-third of content features store information such as opening hours and special offers, while the remaining two-thirds is dedicated to brand advertising. Advertisers include the likes of Danone, Nestle, Unilever, Mondelez and Coca-Cola, who take advantage of Mediaperformances’ total shopper audience, especially knowing that 68% of purchase decisions are made in-store. To date, measured campaigns have shown up to a 15% increase in sales. To learn more about BroadSign’s offerings in the French region and in the retail vertical, readers can book a meeting with a representative at #NRF17 or at #ISE2017 and apply for a free 60-day trial. This entry was posted on Thursday, January 5th, 2017 at 13:31 @605 and is filed under DailyDOOH Update. You can follow any responses to this entry through the RSS 2.0 feed. You can leave a response, or trackback from your own site.